How many times have you seen a building with failed lights on the outside, or mismatching colours? Chances are that when the lights were first installed, it looked fantastic, but it’s probably long overdue a refit. In this article, we’ll look at 4 different ways to tell that a lighting installation needs updating. Sooner or later, all luminaires will fail. Sometimes, depending on the installation, it won’t be that noticeable if a few fixtures have failed, but often there will be gaps in the lighting scheme or details that are not illuminated. Even worse, with colour mixing LED fixtures, a single channel can fail which means that the luminaire will be on the wrong colour- imagine a situation where red and green channels are being mixed to create amber, but the red channel has failed on one fixture so one of the lights is green instead. Over time, all types of lights drop in output; the lifetime of LED fixtures is usually measured to when the light output is at 70% of what it was initially (this is called L70). 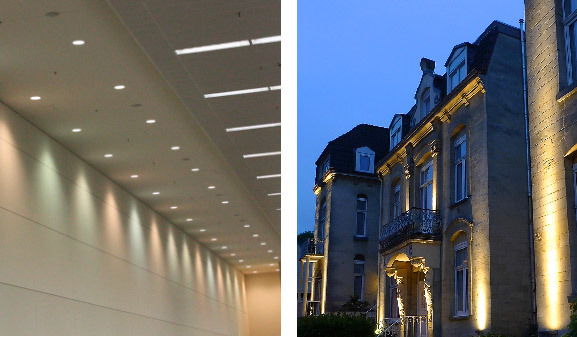 Over a long period of time, the light output of the fixtures will change, so what was once a vibrant installation will eventually look faded and dull. Subtle variations in colour can be obvious, and this is something that will happen to luminaires over time, particularly those that are driven hard or use lower quality components. When the light output of a fixture changes over time, the red, green and blue portions will not necessarily drop at the same rate. If the ratio between two colours, say red and blue, changes over time, mixing those colours together will have different results. This is not such a visually obvious sign that lights need changing, but it is still very important. If a lighting scheme is still using metal halide, halogen or other traditional lamp types, it will be far less energy efficient than an LED scheme. Often the cost of upgrading to LED fixtures will be offset by the energy savings provided by the more efficient lights. At Pulsar Light of Cambridge Ltd. With a World Record: LED Installation-Longest Continuous Service, with two lighting installations that have surpassed the 100,000 hours point and are still going strong, we are dedicated to designing and manufacturing the most reliable, durable and longest lasting luminaries.